Artist HOTTEA began his work with typography on fences turning an ordinary everyday object into something designers and artists use everyday – the grid. The foundation behind the work of HOTTEA is to use the existing infrastructure and create an artwork or idea that is in harmony within the given space. In addition to adapting to the physical qualities of a space or surface- the artist plays close attention to the movement and life in and around the space. For example – do people stop and socialize within a given area or is it common to continue moving? What other physical objects are around the area? Is there a river perhaps or maybe a busy street? All of these factors come into play when HOTTEA designs and activates a space or surface. – HOTTEA brings both new dimensions and new materials to the festival. 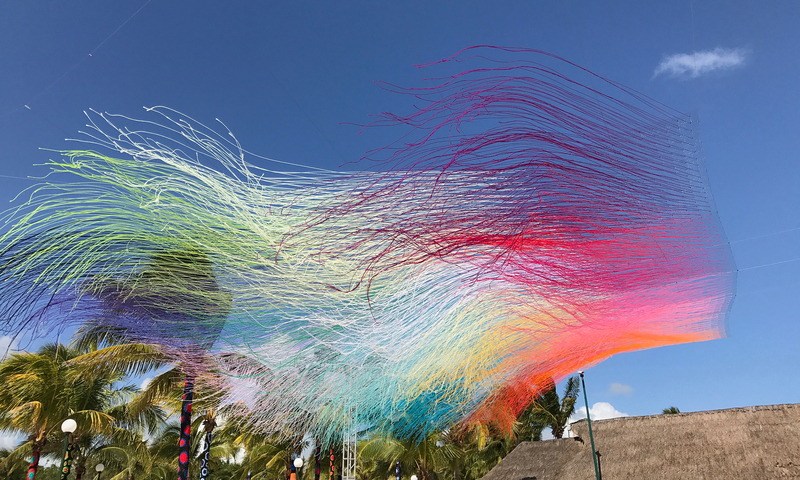 The pieces are really a sparkling inferno of colors and I love how he moves between static symmetric installations and the ones that hang down, allowed to be formed by the wind. 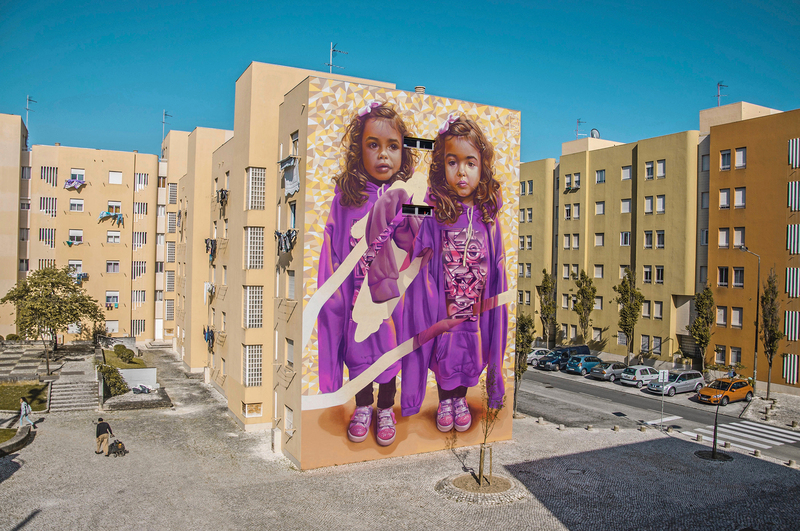 There´s a lot of joy but at the same time a deep form of tranquility in his pieces that will be enjoyed by many, says Shai Dahan, curator of No Limit Street Art. – I´m happy that we´re able to include more techniques and diversity to No Limit. The installations of HOTTEA is amazing and what could be more suitable in the textile city of Borås, says Stina Hallhagen, project manager. No Limit has been selected to receive the EFFE “Remarkable Festival” Label. An international jury approved the label and after that the festival has gone through a successful evaluation by EFFE Hub experts on national level. EFFE, which stands for Europe for Festivals – Festivals for Europe gives the label ”Remarkable Festival” to festivals fulfilling the following criteria artistic commitment, community involvement and a festival’s international and global outlook. – We´re both happy and proud to receive the EFFE label. It feels like yet another confirmation that we´re doing the right things. The label it self means a lot of course, but it´s also an important network for exchange of experience with other festivals as well as a good channel for marketing of Borås and No Limit, says Stina Hallhagen, project manager. Cinta is deeply in to experimenting when it comes to illustration. She has worked as a freelancer for various clients but has gradually been heading to the world of painting and her own work. – Cintas paintings are really masterpieces in details. It´s like Penrose stairs gone mad and the illusion get´s more obtrusive the more you trying to sort it out. 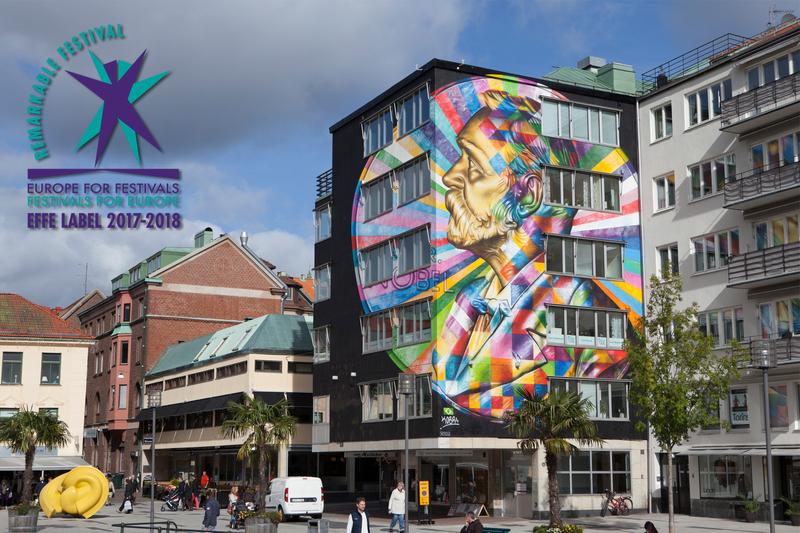 Her art in Borås is going to appeal to people of all ages, that´s for sure, says Shai Dahan, curator of No Limit Street Art. – Her art is amazing, precise and illusionistic at the same time. The environments and small houses are like a three-dimensional Rubiks cube, you wan´t to grab it from the wall or the canvas to be able to turn and tweak it around. I really look forward to see her piece in Borås, says Stina Hallhagen, project manager. Interpretation is an ongoing study in their process and final results. Their more recent body of work contains playfulness in abstraction of reality, attempting to make the viewer have a different perspective on the subjetcs used. – TelmoMiel is really a dynamic duo, it may sound like a cliché, but it´s really amazing to see how their different layers interact with one another to form one piece. 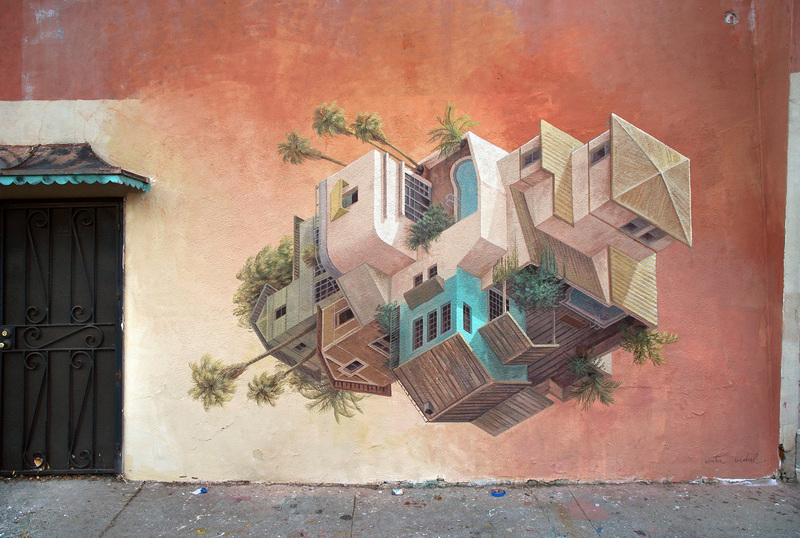 They are highly talented artists in general and their large scale murals are really mind blowing. Really happy to have them here for No Limit 2017, says Shai Dahan, curator of No Limit Street Art. – I´m glad to have TelmoMiel for several reasons. First of all because of their beautiful and colorful art of course. I love how they master the shadings and how they are able to switch between realism and surrealism in different parts of their pieces, still keeping it together as a whole. Besides that we´ve technically never had Dutch artists in before (as the London Police, living in Amsterdam, are born in the UK) and a wide cultural background of artists adds a width to the festival, says Stina Hallhagen, project manager. NeSpoon create works somewhere between street art, pottery, painting, sculptures and jewelry. She would like to make positive art and to deal with positive emotions. 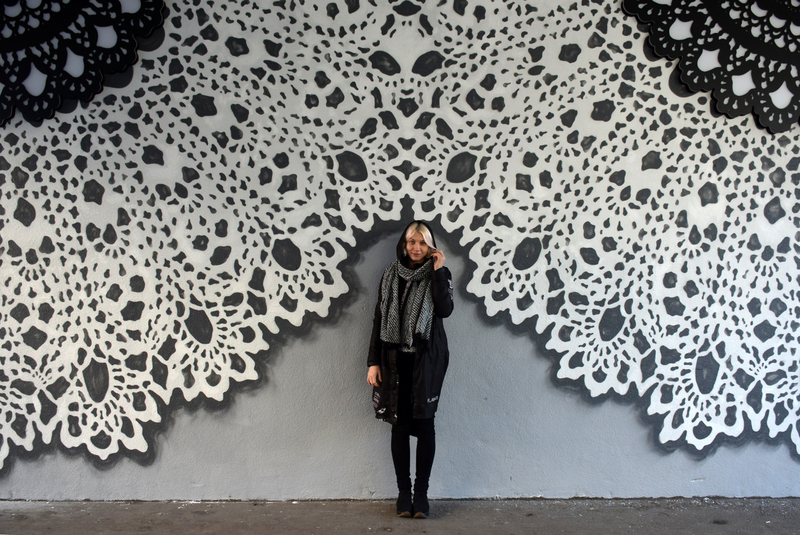 Most of her work consists of prints of traditional laces, made in clay or painted on the walls. She gets the inspiration from hand made laces, made by the folk artists, which containes an aesthetic code, deeply embedded in every culture. Symmetry, some kind of order and harmony is part of every lace and according to NeSpoon that´s what we all seek for, instinctively. – NeSpoons art challenges my brain, and i really do understand the sense of inner peace she says that the making of this pieces bestows her. The patterns got a depth and three dimensional feeling fooling your brain to believe it´s a gigantic table cloth that you´ll be able to pick off the wall. She´s a multi-faceted artist mastering so many art techniques making me envious of her amplitude, says Shai Dahan, curator of No Limit Street Art. – At first sight of NeSpoons art I knew instinctively that I wanted her in the line up of No Limit 2017. The veracity and details in her pieces are really amazing. Although it´s almost always made out of black and white, which can be quite hard the artwork feels warm and breathes tranquility, says Stina Hallhagen, project manager.